I absolutely love these delicious Jicama Chili Fries. Jicama (pronounced \ˈhē-kə-mə\ is a a pale brown turnip with a crisp sweet taste. It is the tuberous root of a tropical American vine (Pachyrhizus erosus) of the legume family that is eaten raw or cooked. The Jicama originated in Mexico. You can find jicamas in most stores. I only used one jicama to produce this big bowl of fries! 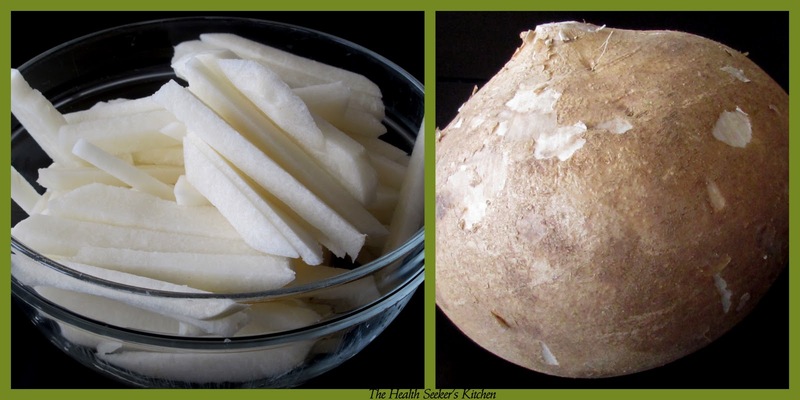 Jicama health benefits are numerous! It is low in calories and an excellent source of fiber, potassium, iron, calcium, and vitamins C and E. In fact, 1 cup of jicama contains nearly 6 grams of fiber. Jicama helps keep your cholesterol levels under control and may help protect against heart disease. Eating jicama also helps boost your immune system, promote healthy bones, and protect you against colds and flu - all great reasons for enjoying jicama. You will love these! 1.) 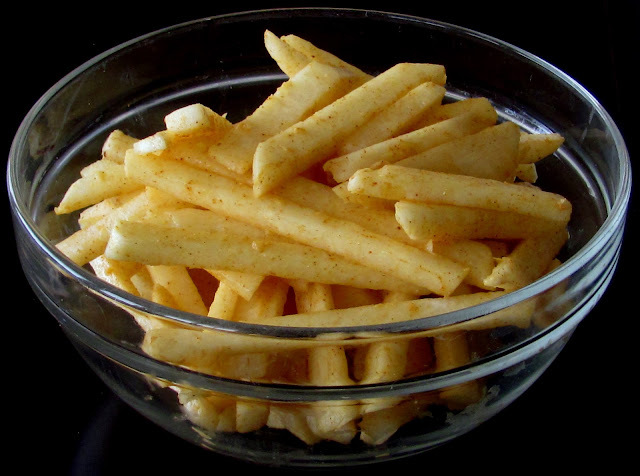 Peel and slice jicama into french fry shapes. Coat well with 1 tsp. olive oil. Add chili powder, nutritional yeast and salt. Mix well and serve. I need to get some jicama! I have not had it in a long time! I like crunch too! Sounds great. I always want to try jicama but I can never really find it, even in Mexican neighborhoods. Or maybe I just pass over "another brown tuber." What a great idea! I can just imagine how crunchy and tasty these are! I'm going to try some asap. I never tried jicama but this sounds delicious! i love jicama, but only ever use it in salads. this is a great idea that i can't wait to try. i am so glad to have found your blog, btw. I often cut up Jicama for Mr. SV to snack on. He's not a fan of nutritional yeast. Wonder if these would be as good without it? Thanks. He's quite the delicate flower don't ya know. Awesome, was introduced to it at an Easter dinner. Just saw it in a salad, and had to try it....delicious!! Jicama, cilantro, red onion, green and red pepper, a touch of cayenne pepper, and a vinegarette. I'll have to try the fries this weekend! !